The PortaPole is designed for rapid deployment to serve as a temporary replacement pole when a permanent signal is out of service or an additional signal is needed temporarily. The PortaPole includes the Galaxy® Wireless Signal Interface System and connects wirelessly to the standard function of a street corner controller in minutes (wired versions also available). 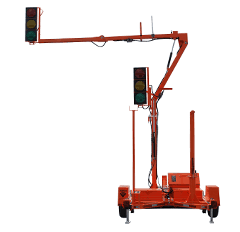 It includes an electric mast – the mast and arm can be raised with the flip of switch. One person can set up the PortaPole in minutes to restore traffic control during signal knockdowns.